View of the Rock of Gibraltar from Spanish town, La Línea de la Concepción. Photo by Mihael Grmek for Wikimedia Commons, with CC BY-SA 3.0 licence. With these words, former Conservative leader Michael Howard sparked one of the most bitter controversies between Spain and the UK in recent years over Gibraltar . What is Gibraltar? It's a small area strategically situated on the cusp of the Mediterranean, that was occupied by the British during the Spanish War of Succession  and subsequently joined Great Britain in the 1713 Treaty of Utrecht . 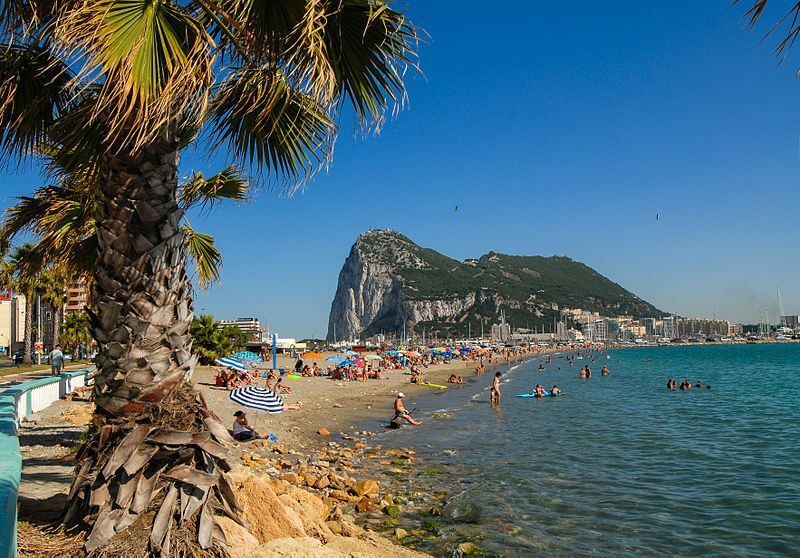 Gibraltar has a little more than 33,000 residents, with a population of many origins, but dominantly Spanish and British, and have traditionally been very hostile towards any negotiation attempt from Spanish authorities  to regain some or total control over the territory. As a British overseas territory, Gibraltar has, until now, enjoyed a privileged position within the European Union, exempt from certain taxes, responsibilities and legislation. However, despite Gibraltarians having voted significantly in favour of remaining in the union in 2016's “Brexit” vote, Gibraltar has few options: given that residents have outright rejecting joining Spain or even co-sovereignty between both countries, the only remaining option is to leave the EU with the United Kingdom. In early April, the European Council distributed guidelines amongst member states to be followed throughout Brexit negotiations. They explicitly state that future agreements between the EU and the United Kingdom will not apply to Gibraltar without Spain's consent, giving the right of veto  to the latter. Spain should learn from history that it is never worth taking us on and that we could still singe the King of Spain’s beard. Spanish authorities, which often utilise Gibraltar as a smokescreen to divert attention from more important issues, have not taken a stance on this almost warlike escalation, and British Prime Minister Theresa May has treated the subject with a certain levity . Internet users from both countries have viewed the situation with even more humour, sowing the rift that exists between certain politicians and the public. For example, a survey by the Spanish edition of the Huffington Post  that asks “Would you enlist in the Army to fight for Gibraltar?” currently holds a 74% negative response (so far, there's a total of 31.1K votes). Why would we want Gibraltar, if we can't already exit a roundabout driving on the right imagine us on the opposite side!!! We have to bring together the best for the naval battle of Gibraltar. -How the hell do we get to Gibraltar now? -I told you this would happen if the goat drove. -And there's no signal either.